Marsman, I'm loving this. Could you doctor one of the clear shots of the boat with Popeye on the flybridge in addition to the other stuff you've done. Use your imagination. I do a slideshow on our big TV for my nephews at Thanksgiving. I've already swiped some of your other treasures. They will be shown only on my TV. The boys are 5 and 9. They "pilot" the boat until they get bored , jump up and leave. They would love the stuff you do. Where can I learn to do it? I used Photoshop to 'enhance' this shot. Just get a copy and play, play, play. That is perfect. Thank you for doing it. I'll get photoshop and play. May I post this enhanced photo elsewhere? Interesting, wonder what the original second shot looked like. I'm sure Godzillla would love snacking on that boat though. a0c8c wrote: Interesting, wonder what the original second shot looked like. 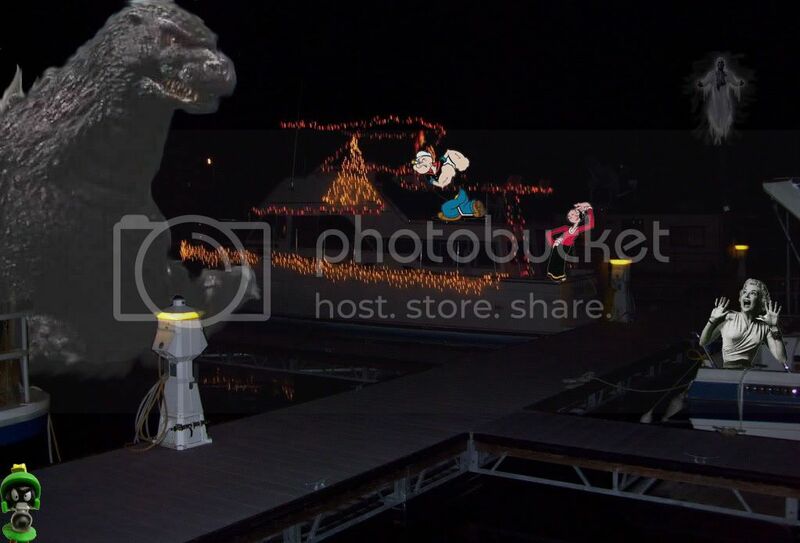 I'm sure Godzillla would love snacking on that boat though. The first three pictures are original and un-doctored. They appear in the first post in the thread. I apologize that they have disappeared a few times. I didn't know that when I created photo albums that I was messing up the original url. Hopefully thet are ok now. I took 3 pictures as fast as my digital camera would cycle. My wife and I were on the dock about 5 feet apart. It was a clear night. Stars were out. The 3 pictures were taken in the order I took them. Neither my wife nor I saw the cloudy thing in the second picture. I used a flash. I was looking through the camera when i shot the pictures. My wife says she didn't notice anything in the flash. Be it a dreadful apparition or some fluky thing due to conditions within the camera, I don't know. It really did spook us when we loaded it into the computer and looked at the pictures. I took an additional 20 or so pictures from different angles. The middle picture in my original post was the only one that had the cloudy thing. We have had some fun with this thanks to a very creative Marsman but I don't know how to photo-shop and you'll have to accept my word on that I guess. The pictures in the original post are exactly what the camera took with absolutely no augmentation from me. I took them. Here's one more, peace on earth, good will to men. Merry Christmas. This was taken a few minutes later. The lights in the background are on a street light. Charlie, the boat looks great! Thanks Marsman we have enjoyed it as have the neighbors. Gerrib, I was just teasing you. I have yet to run into meanness at The Helpful Gardener. Am enjoying your pictures, by the way! This is a photo I took when walking on one of my roads. 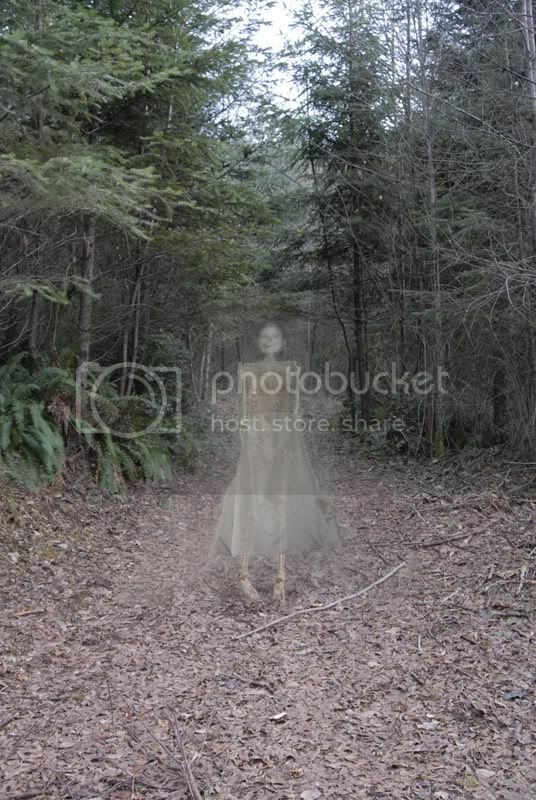 Wow, that is a classic ghost picture. I used to volunteer at a boyscout camp in California when I lived there, and this camp literally WAS haunted. For one thing, underneath the archery range were three human skeletons with no heads. Creepy, I know. Then there was this really cool adobe. We all just called it the old adobe, and I never knew the real name for it. But there were too many legends about it to count. This is my favorite legend about it, and like all legends the facts are fuzzy, but all show the same picture. The adobe was built by monk(s) who were trying to bring religion to the native americans that lived there, so they made the adobe. During this time, there was a rainstorm and one of the rooms collapsed. They never repaired it. Later, men came and for whatever reason, killed one of the monks. Some people told it in their story that he didn't beleive the right things, or that he commited a sin or just made these new guys really angry. Whatever it was, they killed him. To stop the other monks from doing whatever the first guy did, when repairing the damaged room, they put his bones in some of the bricks. Much later in time, a woman was staying at the adobe. One morning, when she woke, there was a man dressed in monks clothes muttering verses from the bible. She ran out of the room half naked and when she and a few others came back, he was gone. My father, in 2007, while walking to the campmaster trailer said he saw a lantern inside. It was moving and he was about to go inside to scold whatever cubscout was inside, but when he made a move towards it, the light went out. When he and the ranger went in, there was no sign the light was ever there. Oh, and in California there are no fireflies. Oh, and I've heard of a legend of a seaman who was sailing up cape cod, and it got so cold that other men were offering to take turns. But he said no, and everyone stayed down under the deck in their rooms. When the storm subsided, they came up and found thta he was still alive, but his hands were dead and frozen to the wheel. So they had to cut them off, and they brought him down to his cot. He died, and when they got back up to the deck, the hands were gone. creepy, i took a picture of a church once cuz it looked like one out of a movie, well when i uploaded it on to my pc i zoomed in and i swear to god i c a ghost sitting on a wall next to the gate on the left side of the pic and a woman walking by the sgine on the right, also if u look hard anouth at the very right hand side of the tower at the top u can c a grim reaper but that just might be me making shapes with my mind.... take a look and tell me what u think. Marsman? Do you see anything?